With great interest and enthusiasm, many scientific research centers around the world are exploring medicinal plants due to global belief of their efficacy in treatment. Members of the family Anacardiaceae  have long reputation in folk medicine for their nutritional value of edible fruits and seeds, and for variable ailments such as treatment of bowel complain, chronic wounds, pimples, boils, jaundice, hepatitis, and inflammatory conditions. As part of on-going study of medicinal herbs, the closely related genera, Harpephyllum caffrum Bernh. and Rhus coriaria L. are subjected to biological testing in order to confirm the claimed herbal benefits of these drugs by different communities. ,, The bark of H. caffrum Bernh. is used to treat acne and eczema, and is usually applied in the form of facial saunas and skin washes. Recent reports revealed that the aqueous and ethanol extracts of H. caffrum Bernh. from South Africa exhibited significant antibacterial and antifungal activities against certain microbial strains. H. caffrum Bernh. has been introduced and cultivated in Egypt as an ornamental garden tree while R. coriaria L.(Sumac) fruits are imported and sold in the Egyptian herbal market as a desirable spice in many Arabic food recipes to impart flavor and aroma. The aqueous extract of Iranian R. coriaria L. fruits showed hepatoprotective activity against oxidative stress cytotoxicity  and antibacterial activity against Salmonella More Details typhimurium. Research on evaluation of these plant extracts and their activities necessitates focusing on their crucial phytoconstituents, as well as, their toxicity if any. Previous phytochemical work on H. caffrum indicated a brief note on a tentative identification of afzelin, quercetin-3-O-β-arabinoside, apigenin-7-O-α-glucoside, kaempferol-3-O-β-galactoside, kaempferol, and quercetin. H. caffrum stem bark extract was previously evaluated for the total polyphenol content and antioxidant activity. Phenolic constituents of Sumac were dealt with in previous reports. , However, nothing could be traced on the phenolic constituents of sumac fruits marketed in Egypt. There is an extensive body of the literature addressing the escalated distribution of hepatic diseases among the people in Egypt. , Since the liver is responsible for the breakdown and elimination of most toxic substances, the need for protecting the liver against poisons is a global health problem. Hepatoprotective herbal drugs can offer help by blocking absorption of toxins into liver cells and the formation of inflammatory substances that contribute to liver degeneration. The nutritional support that these plants can offer is indispensable in nowadays life. Samples of the leaves of H. caffrum Bernh. were obtained from trees growing in El Orman botanical garden, Giza, and identified by the Botany Department, Faculty of Science, Cairo University, Giza, Egypt. Samples of the fruits of Rhus coriaria L. were obtained from a herbalist shop in Cairo and identified as previously mentioned. Samples of both plants are deposited at the Museum of the Pharmacognosy Department, Faculty of Pharmacy, Cairo University. Ultraviolet lamp (λmax =254 and 330 nm), Shimadzu, a product of Hanovia lamps for localization of spots on chromatograms. UV absorption spectra were determined on a Shimadzu UV-1650PC spectrophotometer in methanol and after addition of different shift reagents. EI-MS were recorded with a Varian Mat 711, Finnigan mass SSQ 7000 Mass spectrometer, eV 70. IR spectra were observed as KBr discs on Schimadzu IR-435, PU-9712 infrared spectrophotometer. 1 H-NMR(300MHz) and 13 C- NMR (75 MHz) spectra were recorded on Jeol EX-300 MHz and Bruker AC-300 spectrometer operating at 300 ( 1 H) and 75( 13 C) MHz in CDOD 3 and CDCl 3 as a solvent and chemical shifts were given in δ (ppm). The air-dried powdered leaves of H. caffrum (2 kg) were extracted by cold percolation with 95% ethanol (5 × 10 L) till exhaustion. The ethanol extract was evaporated under reduced pressure to give 350 g greenish brown semi-solid residue. 350 grams of the dried residue were suspended in distilled water and successively partitioned between n-hexane, chloroform, ethyl acetate, and n-butanol saturated with water. The solvent in each case was completely evaporated under reduced pressure to yield 11 g, 4 g, 9 g, and 3 g, respectively. The dried powder (2.5 kg) of the fruits of Rhus coriaria L. were similarly treated to give 245 g. Successive partitioning between different solvents led to preparation of 35.9 g of n-hexane, 28.6 g of chloroform, 90 g of ethyl acetate, and 5.5 g of n-butanol saturated with water extractives. The n-hexane extract was chosen for isolation of active compounds. 11 g of the n-hexane extract were chromatographed on a VLC column, 210 g silica gel (12.5 × 7 cm) using n-hexane, n-hexane-chloroform and chloroformethyl acetate mixtures. Fractions, 200 ml each, were collected and monitored by TLC. Similar fractions were pooled together to obtain four major fractions (A-D). Fraction A (1.04 g), eluted with 100% n-hexane, was purified on a silica gel column using n-hexane as an eluent to obtain compound 1 (20 mg). Fraction B (0.49 g), eluted with 15% chloroform in n-hexane, was purified on silica gel column using n-hexane-chloroform mixtures as an eluent to obtain compound 2 (40 mg). Fraction C (1.02 g), eluted with 35% chloroform in n-hexane, was purified on silica gel column using n-hexane-chloroform mixtures as an eluent revealed two spots. Further rechromatography on successive silica gel columns using n-hexane-chloroform mixtures yielded two compounds 3 (20 mg)and 4 (40 mg) . Fraction D (3.81 g), eluted with 60% chloroform in n-hexane, was subjected to chromatography on successive silica gel columns using n-hexane-chloroform mixtures to afford compounds 5 (60 mg) and 6 (50 mg). Based on yield and chromatographic pattern, the ethyl acetate extract was selected for isolation of active compounds. 9 g of the ethyl acetate extract were chromatographed on a CC (100 g polyamide, 50 cm × 3 cm) using water and water-methanol mixtures. Fractions, 100 ml each, were collected and monitored by TLC. Similar fractions were pooled together to obtain four major fractions (I-IV). Fraction I (2 g), eluted with 10%, 20% methanol in water revealed the presence of three major spots.Further rechromatography using sephadex LH 20 and water- methanol in decreasing polarity as eluent led to the isolation of three phenolic compounds, 7 (90 mg), 8 (80 mg)and 9 (40 mg) . Fraction II (1.37 g), eluted with 40%-60% methanol in water, was further subjected to rechromatography on RP 18 silica column using water- methanol as eluent and resulted in separation of five compounds 10 (30 mg), 11 (50 mg), 12 (60 mg), 13 (50 mg), and 14 (30 mg). Fraction III (1.67 g), eluted with 90-100% methanol, was refractionated and repurified to yield compounds 15 (30 mg) and 16 (50 mg). 90 g of the ethyl acetate extractive of the fruits of R. coriaria were chromatographed on a VLC column (150 g silica gel, 30 cm × 4 cm) using n-hexane, n-hexane-chloroform, and chloroform-ethyl acetate mixtures. Similar fractions were pooled together to obtain four major fractions (a-d). Rechromatography on different stationary phases including sephadex LH 20 , and silica gel RP-18 led to isolation of compounds 15, 16 (from fraction a), 7, 8 (from fraction b), 17 (50 mg) (from fraction c), 18 (50 mg), and 19 (60 mg) (from fraction d) in a pure form. Ten g of the dried ethanol extract previously prepared was dissolved in distilled water containing few drops of Tween 80 to yield a concentration of 5% w/v. The leaf ethanol extract of H. caffrum was tested for its hepatoprotective, anti inflammatory, analgesic, and antipyretic activities. Carrageenan: Sigma Co.(0.1 ml of 1% solution, to induce inflammation), indomethacin: Epico, A.R.E. (20 mg/kg body weight [b. wt. ], standard anti inflammatory), Brewers dry yeast: Rehab food company (1 ml/100 g b. wt. of 40% suspension by intramuscular injection to induce hyperthermia), paracetamol (Paramol): Misr, Mataria, Cairo (20 mg/kg b. wt., standard antipyretic), dipyron-metamizol (Novalgin): Hoechst Orient, Cairo (50 mg/kg b. wt., standard analgesic), carbon tetrachloride (Analar, El-Gomhoreya Co., Cairo, Egypt, for induction of liver damage (5 ml/kg of 25% CCl 4 in liquid paraffin, IP), Silymarin (Sedico Pharmaceutical Co., 6 October City, Egypt, standard hepatoprotective drug (25 mg / kg b. wt. ), biodiagnostic kits for assessment of serum alanine aminotransferase (ALT), aspartate aminotransferase (AST), and alkaline phosphatase enzymes (ALP). Adult male albino rats (130-150 g) were obtained from the animal-breeding unit of National Research Center, El-Dokki, Giza, Egypt. All animals were fed on a standard laboratory diet under hygienic conditions and water supplied ad lb. For testing the effect on the liver, 50 adult male albino rats were used and divided into five groups (each of 10). The leaf ethanol extract of H. caffrum of H. caffrum was tested for its hepatoprotective activity using silymarin as a reference drug. The tested extract was administered at a daily dose of 50, 75, and 100 mg/kg b. wt. for 1 month before induction of liver damage. Administration of the tested solution was continued after liver damage for another 1 month. Serum levels of AST, ALT  and ALP enzymes  were measured in each group at zero time, after 1 month of receiving the tested drug, 72 h after induction of liver damage, and after 1 month of treatment with the tested samples. The acute anti-inflammatory effect was determined according to the published procedures. 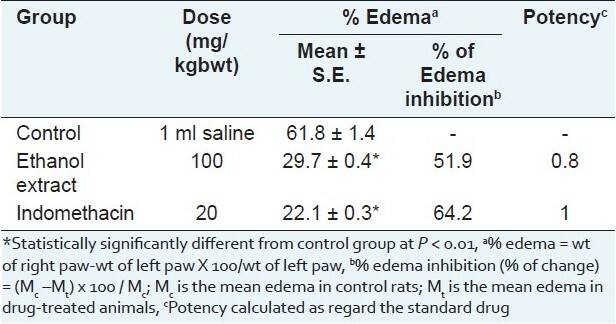 The percentage of edema inhibition (% of change) was calculated. The analgesic effect was evaluated according to standard methods  by using electric current as a noxious stimulus where electrical stimulation was applied to the rat tail by means of 515 Master shocker (Lafayette Inst. Co.) using alternative current of 50 cycles/s for 0.2 s. The minimum voltage required for the animal to emit a cry was recorded after 1 and 2 h of oral administration of the tested dose. The percentage of change was calculated. The induced rise of temperature of rats was recorded at zero time and in the treated groups after one and two hours. The percentage of change was calculated and the results are recorded. Human tumor cell lines: liver carcinoma (HEPG2), colon carcinoma (HCT116), and larynx carcinoma (HEP2) cell lines, maintained in the laboratory of Cancer Biology Department of National Cancer Institute, Cairo, Egypt were used. The ethanol extract at different concentrations (0-10 μg/ml) in DMSO were tested for cytotoxicity against the fore mentioned human tumor cell lines adopting sulforhodamine B stain (SRB) assay. The relationship between surviving fractions and the extract concentration was plotted to get the survival curve of each tumor cell line after the application specific concentration. The results were compared to those of the standard cytotoxic drug, Doxorubicin (10 mg Adriamycin hydrochloride, in 5 ml IV injection, Pharmacia, Italy) at the same concentrations. The dose of the test solutions which reduces survival to 50% (IC 50 ) was calculated. The antimicrobial activity was performed against selected bacterial and fungal strains of standard properties. These were maintained in the Micro Analytical Center, Faculty of Science, Cairo University. The tested Gram positive bacteria were [Bacillus subtilis ATCC 6051, Streptococcus faecalis ATCC 19433 and Staphylococcus aureus ATCC 12600]. The Gram negative bacteria included [ Escherichia More Details coli ATCC 11775, Pseudomonas aeruginosa CC 10145 and Neisseria More Details gonorrhea ATCC 19424], and fungi [Candida albicans ATCC 26555 and Aspergillus flavus ]. Bacteria were grown on nutrient agar (Oxoid, England) and fungi on Sabouraud's glucose agar (Oxoid, England). The ethanol extract was tested against the selected strains at concentration of 20 mg/ml adopting the disc agar diffusion method. Discs impregnated with Ofloxacin and Fluconazole were used as antibacterial and antifungal standards, respectively. Test solution was prepared by dissolving in DMSO at a concentration of 20 mg/ml; aliquots, 10 μl each were aseptically transferred into sterile discs of Whatman filter paper 8 mm diameter. Column chromatographic fractionation of the n-hexane fraction of the ethanol leaf extract of H. caffrum allowed the isolation of six compounds (1-6) which were characterized through their physicochemical and spectral data. Compound 1: Hendecane (20 mg, oily), soluble in hexane, negative test for sterol and/or triterpenes, R f values 0.47 (S 1 ) and 0.93 (S 3 ). IR υ max KBr spectrum shows absorption peaks: 2920 and 2820 cm -1 (C-H), 1464,1460 cm -1 (-C-CH 3 ) and 730,720 cm -1 for - (CH 2 ) n , EI Mass (70 eV) m/z:156 (M + ), 57 (100%). 1 H-NMR (300 Hz CDCl 3 ): 0.90 ppm (3H, t, J=6 Hz), terminal CH 3 and 1.25 ppm [saturated alkyl chain, (-CH 2- ) n ]. Compound 2: Methyl linoleate (40 mg, yellow oily), negative test for sterol and /or triterpenes. R f values 0.17 (S 1 ) and 0.60 (S 3); IRυmax KBr spectrum shows absorption peaks: 2921, 2855 cm -1 (CH), 1742 cm -1 for ester carbonyl (C=O) and 1462, 880 cm -1 (-C=CH 2 ) and (CH 2 ) methylene vibration at 722 cm -1 . EI Mass (70 eV) m/z: 294(M + ), 263 (M + -CH 3 -O), 287, 178, 164, 149, 95, 81, 67, 56, 41. 1 H-NMR (300 Hz CDCl 3 ): Showed signals at 0.88 ppm (3H, t, J=6 Hz), terminal Me and 1.26 ppm [complex signal from methylenic groups in fatty acid, [(alkyl chain (CH 2 ) n ],1.5 ppm [2H, m, C-3 (βCH 2 -αCH 2-CO)] from methylenic group in β-position with respect to carbonylic group, 2.04 ppm (4H, m, -CH 2 -C=C-CH 2 -) allylic methylene [of C-8,C-14], 2.3 ppm, (m, from methylene group in α-position with respect to carbonyl group(αCH 2 CO)of C-2), 2.8 ppm(2H,m,C-11[-C=C-CH 2 -C=C-)] diallylic methylene, 3.66 ppm (3H, s, OMe) and ~5.35 ppm (m, olefinic protons of fatty acid). Compound 3: Betulonic acid (20 mg, colorless crystals), m.p. (261-264), positive test for sterol and /or triterpenes. R f values (0.54 S 4 and 0.13 S 3 );color in p-anisaldehyde /H 2 SO 4 is violet.IR υmax KBr spectrum: Incorporated absorption bands at (3400-3000) of OH group and 1695 cm -1 for acid(C=O), 1707 cm -1 characteristic for cyclic ketone and 1459,890 cm -1 for (C=CH 2 ).EI Mass (70 eV) m/z; 454 (M + ) calculated for C 30 H 46 O 3 with characteristic fragmentation at 438 (M + -H 2 O), 409 (M + -COOH), 245, 218, 205 and 189 lupane skeleton. 1 H-NMR (300 Hz CDCl 3 ): Exhibited signals due to six tertiary methyl groups at 0.82 (3H, s, C 26 -CH 3 ),0.97(3H, s, C 27 -CH 3 ),1.03(3H, s, C 24 -CH 3 ),1.08 (3H, s, C 23 -CH 3 ), 1.26(3H, s, C 25 -CH 3 ) and 1.69(3H, s, C 30 -CH 3 ) and 4.69(1H, s, C 29 -H b ),4.54(1H, s, C 29 -H a ), ~2.3(H, m, C 2 -CH 2 ). Compound 4 : 3-acetyl methyl betulinate (40 mg, prisms from methanol/CHCl 3 ), m.p. (201-202), positive test for sterol and /or triterpenes. R f values 0.96 (S 4 ) and 0.86 (S 5 ); color in p-anisaldehyde /H 2 SO 4 is violet. IR υmax KBr spectrum: Incorporated absorption bands at 1736 cm -1 which is characteristic for acetyl ester group and 1638, 877 cm -1 for (C=CH 2 ). EI Mass (70 eV) m/z 512 (M + ) calculated for C 33 H 51 O 4 with characteristic fragmentation at m/z 468 (M + -acetyl group),by loss of 44, m/z 453 (M + -COOCH 3 ) loss of 59, m/z 249 (allocate the acetyl group at C-3), 262 (indicative for the presence of carbomethoxyl group at C-28) , m/z 218, m/z 203 and m/z 189 all in accordance with lupene skeleton. 1 H-NMR (300 Hz CDCl 3 ): Exhibited four tertiary methyl groups at 0.80(6H, s, C 23 -CH 3 , and C 24 -CH 3 ), 0.85 (3H, s, C 25 -CH 3 ), 0.95 (3H, s, C 26 -CH 3 ), 1.04 (3H, s, C 27 -CH 3 ) and 1.69 (3H, s, vinylic methyl ,C 30 -CH 3 ), 2.05 (3H, s, CH 3 CO), and 4.45(1H, dd, J=6 Hz, 10.5 Hz ,C 3 -H-axial) also at 3.67 (3H, s, COOCH 3 ) and 4.69(1H, s, C 29 -H b ), 4.58 (1H, s, C 29 -H a ). Compound 5: Lupenone (60 mg, white needle crystals from methanol), m.p. (170 o C), positive test for triterpenoid skeleton. R f value 0.43 (S 1 ); color in p-anisaldehyde/H 2 SO 4 is violet. IR υmax KBr spectrum: Showed characteristic absorption bands at 1707 cm -1 indicate cyclic ketoneand 1641, 1455, 878 cm -1 for (C=CH 2 ). EI Mass (70 eV) m/z showed (M + ) at 424 indicating a molecular formula C 30 H 48 O. High mass daughter peaks showed loss of methyl at m/z 409 (M+-15), 245, 218, 205 (oxo-group in C-3) and 189 all in accordance with lupene skeleton. 1 H-NMR (300 Hz CDCl 3 ) exhibited six methyl signals at 0.80(3H, s, C 28 -CH 3 ), 0.93 (3H, s, C 24 -CH 3 ), 0.96 (3H, s, C 27 -CH 3 ), 1.03 (3H, s, C 23 -CH 3 ), 1.07 (6H, s, C 25 -CH 3 , C 26 -CH 3 ) and 1.69 (3H, s, vinyl methyl, C 30 -CH 3 ), 2.38 (2H, m, C-2) and 4.70 (1H, d, J=2.5 Hz, C 29 -H b ), 4.58 (1H, d, J=2.5 Hz, C 29 -H a ) 2 vinylic proton showing allylic coupling with C-19 proton. Compound 6: Lupeol (50 mg, crystallize from methanol as white needle crystals, m.p. (210-212), positive test for triterpenoid skeleton. R f values 0.77 (S 4 ) and 0.32 (S 5 ); violet color with p-anisaldehyde/H 2 SO 4 spray reagent. IR υmax KBR spectrum: Incorporated absorption bands at 3415 cm -1 (OH), 2945, 2869 cm -1 (CH) and 1642, 880 cm -1 for (C=CH 2 ). EI Mass (70eV) m/z(M + ) at 426.7 calculated for C 30 H 50 O with characteristic fragment ions at 411(M + -Me), 393 (M + -Me-H 2 O),365,299,297,245, fragment ions at m/z 220, m/z207(allocate the hydroxyl group at C 3 position),m/z 218, m/z 205 and m/z 189 all in accordance with lupene skeleton. 1 H-NMR (300 Hz CDCl 3 ):Revealed signals for seven tertiary methyl groups at 0.80 (3H, s, C 28 -CH 3 ),0.85(3H, s, C 23 -CH 3 ), 0.86 (3H, s, C 24 -CH 3 ), 0.87 (3H, s, C 25 -CH 3 ), 0.95 (3H, s, C 27 -CH 3 ),1.04(3H, s, C 26 -CH 3 ) and 1.69 (3H, s, vinylic methyl , C 30 -CH 3 ), 3.15 (1H, dd, J=6 Hz, 10.5 Hz and 4.69(1H, s, C29 -Hb ), 4.58 (1H, s, C29 -Ha ). The isolated compounds 1-6 were identified by comparison of MS, IR, 1 H-NMR, and 13 C-NMR data to previously reported ones and were identified as hendecane 1, [ 28] methyl linoleate 2 , , betulonic acid 3 ,  3-acetyl- methyl betulinate 4 ,  lupenone 5 ,  and lupeol 6 . , It is noteworthy to mention that these compounds are isolated for the first time from the leaves of H. caffrum. Chromatographic fractionation of the ethyl acetate fraction of the ethanol extract of the fruits of R. coriaria L afforded seven phenolic compounds 7 , 8 , 14, 15, 17-19. Compound 17 : Protocatchuic acid (50 mg, white to brownish white powder, crystallized from water as colorless needles, soluble in acetone and methanol, m.p. (179-182 o C). R f value 0.81(S 9 ), in visible light brown color with NH 3 . Dark purple in UV and deep blue color with FeCl3 UV λmax nm 260,295 in MeOH, IR√max KBr spectrum: Shows absorption peaks at 3367 cm -1 (OH), 1693 cm -1 (C=O), and 1626 cm -1 for C=C aromatic, 719, 771, 869 cm -1 (-C-H) aromatic. EI Mass (70 eV)m/z;[M + ]=m/z 154(M + ),137 [M + -17 (OH)]110[M + -44 (CO 2 )],109[M + -45(COOH)],81[(109-28(CO)],78 ,62, 53. 1 H-NMR (300 Hz CDOD 3): Showed signals at δ 6.79 (1H, d, J=8.1 Hz, H-5)7.52(1H, d, J=2.1 Hz, H-2)7.46 (1H, dd, J=8.1, 2.1 Hz, H--6). Compound 19: Myricetrin (60 mg , yellowish brown powder crystallize twice from ethanol as pale yellow plates (m.p. 199-200 °C). 0.64 (S 7 ) and 0.25 in (S 9 ). 1 HNMR spectrum showed * Aglycone: 7.14 (2H, s, H-2` and H-6`),6.56(1H, d, J=2.1 Hz,H-8),6.39(1H,d,J=2.1Hz,H-6). * Sugar :5.51(1H, d, J((H-1``/H-2``)=1.5 Hz, H-1``),4.23(1H,dd,J(H-2``/H-1``)= 1.6; J(H-2``/H-3``)=3.4 Hz, H-2``) ,3.77(dd,J(H-3``/H-2``)=3.4;J(H-3``/H-4``)=9Hz,H-3``),3.47-3.30(m)H-4``,5``and 0.95(3H,d,J((CH 3 /H-5``)=5.8, CH 3 -5``). 13 CNMR spectrum showed 177.5 (C-4),164.4(C-7),161.2(C-5),156.5(C-9),156.3(C-2),145.6(C-3`,C-5`),136.8(C-4`),133.9(C-3),119.8(C-1`)108.5(C-2`and C-6`),103.9(C-10),102.0(C-1``), 98.8 (C-6),93.6 (C-8),72.16(C-5``), 72.04 (C-3``),71.93(C-2``), 73.28(C-4``) and 17.65 (C-6``). To the best of our knowledge, this is the first report on isolation of protocatechuic acid 17 , quercetin-3-O-β-D-glucopyranoside (isoquercitrin) 18 and myricetin-3-O-α-L-rhamnopyranoside (myricetrin) 19 from the fruits of Sumac. However, these compounds were previously identified in the leaves  but isolated for the first time from the fruits of R. coriaria L.
The performed liver function test includes administration of CCl 4 to male albino rats to induce functional impairment of the liver. 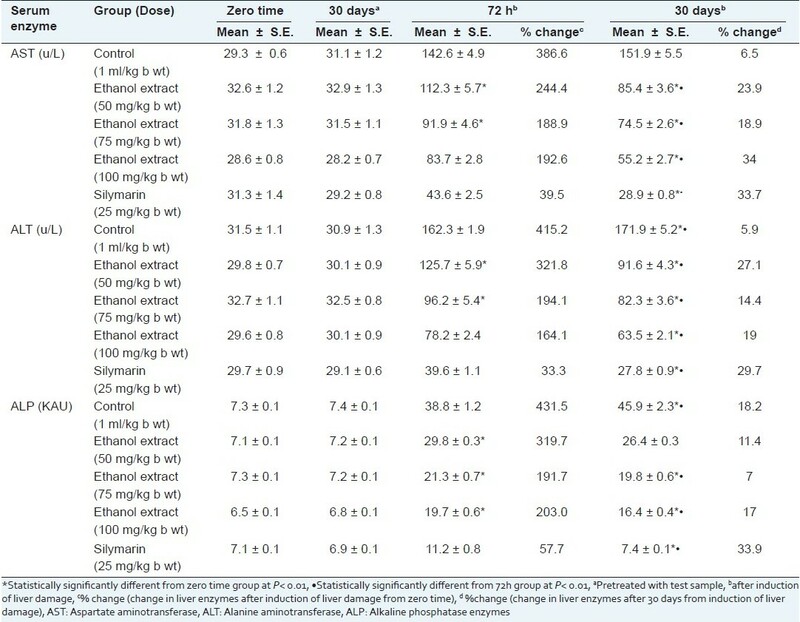 The damage of the liver caused by CCl 4 in male albino rats was evident by the alteration in serum transaminases (ALT, AST, and ALP) levels concentration [Table 1]. Compared to the control group, CCl 4 caused a significant elevation in serum ALT, AST, and ALP levels. Hepatic protection was evidenced by the ability of H. caffrum leaf extract to normalize the high enzyme parameters in a dose-dependent manner (50, 75, and 100 mg/kg) by 100% for AST, 64% for ALT, and 50% comparable to silymarin. The presence of flavonoids, triterpenes, and phenol acids in H. caffrum in considerable amounts (about 15%, 8.5%, and 10.5%) explain its role in liver protection since flavonoids, triterpenes, and tannins are known to possess hepatoprotective activities. ,, Betulonic acid, one of the isolated triterpenes from H. caffrum , is potentially active as antioxidant and antitumor. Certain flavonoids are known as antioxidant agents and may interfere with free radical formation. The results obtained in this study suggest that the ethanol leaf extract of H. caffrum can normalize elevated liver enzymes. The biological activity evidenced in this study, namely hepatoprotective, anti-inflammatory, analgesic, antimicrobial, and in vitro cytotoxic activities of H. caffrum are reported for the first time. However, further investigation is needed to ascertain the precise mechanism(s) of these activities. 1. Bailey LH. The Standard Cyclopedia of HorticultureIII. New York: The Macmillan Company; 1953. p. 2952-4. 2. Abbasi AM, Khan MA, Ahmad M, Zafar M, Jahan S, Sultana S. Ethnopharmacological application of medicinal plants to cure skin diseases and in folk cosmetics among the tribal communities of North-West Frontier Province, Pakistan. J Ethnopharmacol 2010;128:322-35. 3. Chopra IC, Handa KL, Kapur LD. Chopra's Indigenous Drugs of India, 2 nd ed. Calcutta: U.N. Dhur and Sons Private Limited; 1958. p. 337,407,498,525. 4. Sezik E, Tabata M, Yesilada E, Honda G, Goto K, IkeshiroY. Traditional medicine in Turkey I. Folk medicine in Northeast Anatolia. J Ethnopharmacol 1991;35:191-6. 5. Van Wyk BE, van Oudtshoom B, Gericke N. Medicinal Plants of South Africa. 2 nd ed. Pretoria: Briza Publication; 2002.p. 146. 6. Buwa LV, van Staden J. Antibacterial and antifungal activity of traditional medicinal plants used against venereal diseases in South Africa. J Ethnopharmacol 2006;103:139-42. 7. Pourahmad J, Eskandari MR, Shakibaei R, Kamalinejad M. A search for hepatoprotective activity of aqueous extract of Rhus coriaria L. against oxidative stress cytotoxicity. Food Chem Toxicol 2010;48:854-8. 8. Gunduz GT, Gonul SA, Karapinar, M. Efficacy of sumac and oregano in the inactivation of Salmonella typhimurium on tomatoes. 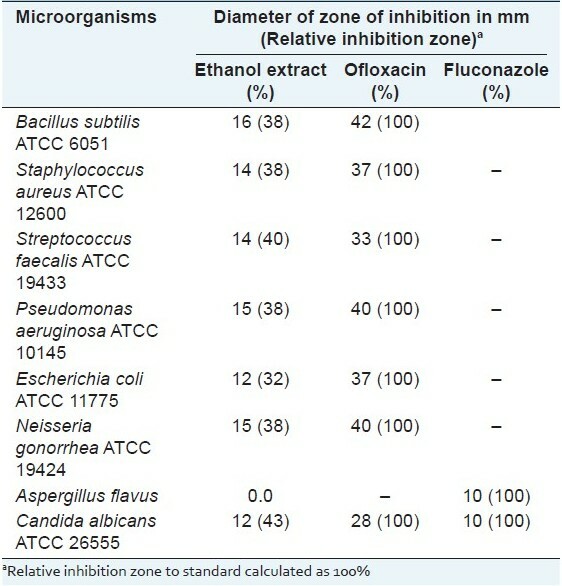 Int J Food Microbiol 2010;141:39-44. 9. El Sherbeiny AE, El Ansari MA. The polyphenolics and flavonoids of Harpephyllum caffrum. Planta Med1976;29:129-32. 10. Moyo M, Ndhlala AR, Finnie JF, Van Staden J. Phenolic composition, antioxidant and acetylcholinesterase inhibitory activities of Sclerocaryabirrea and Harpephyllum caffrum (Anacardiaceae) extracts. S Afr Food Chem 2010;123:69-76. 11. Mavlyanov SM, IslambekovSh Yu, Karimdzhanov AK, Ismailov AI. Anthocyansand organicacids of the fruits of some species of Sumac. Chem Nat Com 1997;33:209. 12. el-Sissi HI, Ishak MS, el-Wahid MS. Polyphenolic components of Rhus coriaria leaves. Planta Med 1972;21:67-71. 13. Lehman EM. Dynamics of Liver Disease in Egypt: Shifting Paradigms of a Complex Etiology. Ph D (Epidemiological Science). USA: The University of Michigan; 2008. p. 1-11. 14. Strickland GT, Elhefni H, Salman T, Waked I, Abdel-Hamid M, Mikhail NN, et al. Role of hepatitis C infection in chronic liver disease in Egypt. Am J Trop Med Hyg 2002;67:436-42. 15. Shabana MM, El Sayed AlyM, Yousif MF, El Sayed Abeer M, Sleem AA. Phytochemical and biological study of Sumac. Egypt J Pharm Sci 2008;49:83-101. 16. Mabry JT, Markham KR, Thomas MB. The Systematic Identification of Flavonoids. 2 nd ed. New York-Berlin-Heidelberg: Springer-Verlag; 1996. 17. Klassan CD, Plaa GL. Comparison of the biochemical alteration elicited in liver of rats treated with CCl 4 and CHCl 3 . Toxicol Appl Pharmacol 1969;18:2019. 18. Paget GE, Barnes JM. Evaluation of Drug Activities Sited in Laboratory Rats. New York: Academic Press Inc.; 1964. 19. Karber G. Beitragzurkollektiven Behandlungpharmokologischer Reihenversuche. Arch Exp Pathol Pharmacol 1931;162:480-3. 20. Thewfweld W. Enzymatic method for determination of serum AST and ALT. Deutsch Med wochen 1974;99:334-47. 21. Kind PR, King EJ. Estimation of plasma phosphatase by determination of hydrolysed phenol with amino-antipyrine. J Clin Path 1954;7:322. 22. Winter CA, Risley EA , Nuss GW. Carrageenin induced edema in hind paw of the rat as an assay for antiinflammatory drugs. Proc Soc Exp Biol Med 1962;111:544-7. 23. Charlier R, Prost H, Binon, F, Dellous G. Pharmacology of an antitussive, 1 phenethyl-4 (2-propenyl)-4-propinoxypipridine acid fumarate. Arch Int Pharmacodyn Ther 1961;134:306-27. 24. Bush IE, Alexander RW. An improved method for the assay of anti-inflammatory substances in rats. Acta Endocrinol (Copenh) 1960;35:268-76. 25. Snedecor GW, Cochran WG. Statistical methods. 8 th ed. Iowa: Iowa State University Press;1989. 26. Skehan P, Storeng R, Scudiero D, Monks A, McMahon J, Vistica D. New colorimetric cytotoxicity assay for anticancer-drug screening. J Natl Cancer Inst 1990;82:1107-12. 27. Lorian V. Antibiotics in Laboratory Medicine.3 rd ed. Hong Kong- London: Williams and Williams; 1991. p. 134-44. 28. Silverstein RM, Webster FX, Kiemie D. Spectrometric Identification of Organic Compounds. 6 th ed. USA: John Wiley Sons Inc.; 1998. 29. Diaz MF, Gavin JA. Characterization by NMR of ozonoid methyl linoleate. J Braz Chem Soc 2007;18:513-8. 30. Jie MS, Mustafa J. High-resolution nuclear magnetic resonance spectroscopy-applications to fatty acids and triacylglycerols. Lipids 1997;32:1019-34. 31. Carpenter RC, Sotheeswaran S, Sultanbawa M, UvaisS, TernaiB. 13 C-NMR Studies of some lupane and taraxeranetriterpenes. Org Magn Reson 1980;14:462-5. 32. Kircher HW. Triterpenes in organ Pipe Cactus. Phytochemistry 1980;19:2707-12. 33. Dantanrayana AP, Savitri NK, Muthukuda PM, Wazeer MI. A lupane derivative and the 13 C-NMR chemical shifts of some lupanols from Pleurostyliaopposita. Phytochemistry 1982;21:2065-8. 34. Agrawal PK. 13 C-NMR of Flavonoids. New York: Elsevier Publishing Company; 1989. p. 292. 35. Shen CC, Chang YS, HoL K. Nuclear Magnetic Resonance Studies of 5, 7-dihydroxyflavonoids. Phytochemistry 1993;4:843-5. 36. Hussein SA, Hashem AN, Seliem MA, Lindequist U, Nawwar MA. Polyoxygenated flavonoids from Eugenia edulis. Phytochemistry 2003;64:883-9. 37. Gutzeit D, Wray V, Winterhalter P, Jerz G. Preparative isolation and purification of flavonoids and protocatechuic acid from sea Buckthorn juice concentrate (Hippophaerhamnoides L. ssp. rhamnoides) by high speed counter current chromatography . Chromatographia 2007;65:1-7. 38. Marzouk M. Acylatedflavonol glycosides and hydrolysable tannins from Euphorbia cotinifolia L. leaves. Bull Fac Pharm Cairo Univ 2008;46:181-91. 39. Proestos C, Boziaris IS, Kapsokefalou M, Komaitis M. Natural antioxidant constituents from selected aromatic plants and their antimicrobial activity against selected pathogenic microorganisms. Food Technol Biotechnol 2008;46:151-6. 40. Yang J, Li Y, Wang F, Wu JC. Hepatoprotective effects of Apple polyphenols on CCl 4 -induced acute liver damage in mice. Agric Food Chem 2010;58:6525-31. 41. Owoyele V, Oguntoye SO, Dare1 K, Ogunbiyi BA, Aruboula EA, Soladoye AO. Analgesic, anti-inflammatory and antipyretic activities from flavonoid fractions of Chromolaenaodorata Bamidele. J Med Plants Res 2008;2:219-25. 42. Babu BH, Shylesh BS, Padikkala J. Antioxidant and hepatoprotective effect of Acanthus ilicifolius. Fitoterapia 2001;72:272-7. 43. Sureshkumar SV, Mishra SH. Hepatoprotective activity of extracts from Pergulariadaemia Forsk. against carbon tetrachloride-induced toxicity in rats. Phcog Mag 2007;3:187-91. 44. Soliman FM, Shehata AH, Khaleel AE, Ezzat SM, Sleem AA. Caffeoyl derivatives and flavonoids from three Compositae species. Phcog Mag 2008;4:1-11. 45. Saleem M. Lupeol. Anovel anti-inflammatory and anti-cancer dietary triterpene. Cancer Lett 2009;285:109-15. 46. Dutta S, Das S. A study of the anti-inflammatory effect of the leaves of Psidiumguajava Linn. on experimental animal models. Phcog Res 2010;2:313-7. 47. Gambhire MN, Wankhede SS, Juvekar AR. Anti inflammatory activity of aqueous extract of Barleri acristata leaves. J Young Pharm 2009;1:220-4. 48. Jager AK, Hutchings A, van Staden J. Screening of Zulu medicinal plants for prostaglandin-synthesisinhibitors. J Ethnopharmacol 1996;52:95-100.